Crucially the ZOE has been designed as an electric car from day one. This means that it doesn’t have the design compromises that come with adapting petrol and diesel models. The layout is reasonably conventional with the electric motor at the front under the bonnet but the large battery is encased in the floor within the wheelbase. Putting the battery in the floor gives the ZOE a low centre of gravity, keeps the batteries safe in an accident and means that you get a large 338-litre boot. There is a slight compromise for rear seat passengers as the rear seats are slightly raised reducing headroom, but there are three seatbelts and adults under six foot can squeeze in. The big news however is the adoption of a new battery which demonstrates the rapid rate of development by packing 41 kWh into the same space as the previous 22 kWh battery whilst adding just 15 Kg in weight. Confusingly Renault has chosen to call models with the bigger pack ’40’ rather than 41. This takes the official range from 149 miles to 250 miles and the minimum real world winter range increases from 71 miles to 124 miles. This makes ZOE a viable everyday option for many. There is a downside to this increase in usability which rather predictably is the price. 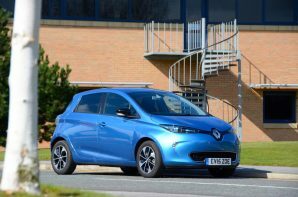 Renault has opted to discontinue the 22 kWh battery which means that an entry level ZOE is now a chunk more expensive, so if you didn’t need the extra range the decision is lamentable. One of the big decision facing prospective ZOE owners is charging options. Renault uses a different system to most utilising AC charging for rapid as well as fast. This means it is limited to 43kW from rapid chargers, such as those at Motorway Services, which deliver 50kW+ to DC enabled cars (everything else!). In a further twist all standard spec ZOEs are only capable of charging at a maximum of 22 kW even if they are plugged into a 43 kW rapid charger. To make full use of these you need to specify ‘quick charge’ at which point the car recharges significantly quicker at rapid charger points but becomes less efficient, less powerful, slower, more expensive, and bizarrely slightly slower charging at 7kW points such as a home charger. This is a result of the installation of the Q90 motor, as opposed to the R110 which standard cars get. Renault’s decision to lease the batteries has some insurance implications but the battery will be replaced free of charge if it falls to less than 75% capacity at any time during the lease. It also makes the ZOE more affordable to buy. You can choose to buy ZOE with batteries if you prefer so it is worth looking at both options to see which suits you best. Compared to a Clio the ZOE is more expensive but has a bigger boot, has more gadgets, and according to Euro NCAP it is safer too! If you travel less than 125 miles a day (or between charges) the ZOE actually makes more sense than the Clio. The electric car has come of age. Recharge time 41kWh: 3kW 15 hours; 7kW (including home charger) 7 hours 25 mins; 22kW 2 hours 40 mins 0-80%; 43kW 1 hour 40 mins 0-80%. Recharge time 41kWh with quick charge: 3kW 15 hours 30 mins; 7kW (including home charger) 8 hours 25 mins; 22kW 2 hours 40 mins 0-80%; 43kW 1 hour 5 mins 0-80%.